Fokker was a Dutch aircraft manufacturer named after its founder, Anthony Fokker. The company operated under several different names, starting out in 1912 in Schwerin, Germany, moving to the Netherlands in 1919. During its most successful period in the 1920s and 1930s, it dominated the civil aviation market. Fokker went into bankruptcy in 1996, and its operations were sold to competitors. At age 20, Anthony Fokker built his initial aircraft, the Spin (Spider)-the first Dutch-built plane to fly in his home country. Taking advantage of better opportunities in Germany, he moved to Berlin where, in 1912, he founded his first company, Fokker Aeroplanbau, later moving to the Gx�rries suburb just southwest of Schwerin, where the current company was founded, as Fokker Aviatik GmbH, on 12 February 1912. Fokker capitalized on having sold several Fokker Spin monoplanes to the German government, and always the opportunist, he set up a factory in Germany to supply the German army. His first new design for the Germans to be produced in any numbers was the Fokker M.5, which was little more than a copy of the Morane-Saulnier G, built with steel tube instead of wood in the fuselage, and with minor alterations to the outline of the rudder and undercarriage and a new aerofoil section. When it was realized that it was desirable to arm these scouts with a machine gun firing through the propeller, Fokker developed a synchronization gear similar to that patented by Franz Schneider. Fitted with a developed version of this gear, the M.5 became the Fokker Eindecker this, due to its revolutionary armament, became one of the most feared aircraft over the western front, and was known as the Fokker Scourge until air supremacy was won away by aircraft such as the Nieuport 11 and Airco DH.2. Schneider sued Fokker over the use of his patents and won, however Fokker managed to evade paying up. During World War I, Fokker engineers were working on the Fokker-Leimberger, an externally-powered 12 barrel gatling gun in the 7.92x57mm round capable of firing over 7200RPM it had the spent brass ruptured. After having evolved the Eindecker into a series of biplane scouts (Fokker D.I) the design was starting to show its age and Fokker was no longer able to keep it competitive, so he arranged for the German government to force an amalgamation with Junkers, and produced a new aircraft using the knowledge he had gained from Junkers of the advantages to be found with using thicker high lift airfoils. Once he had gained access to Junkers aerodynamic researches, he arranged for the merged companies to be split again, and continued to build the new fighters without any recompense to Junkers for his work. Aircraft that resulted from this theft included the Fokker D.VI, Fokker Dr.I Dreidecker (the mount of the Red Baron), Fokker D.VII (the only aircraft ever referred to directly in a treaty: all DVII's were singled out for handover to the allies in ther terms of the armistice agreement) and the Fokker D.VIII. In 1919, Fokker, owing large sums in back taxes (including 14,250,000 marks of income-tax), returned to the Netherlands and founded a new company near Amsterdam with the support of Steenkolen Handels Vereniging (now known as SHV Holdings). It was called Nederlandse Vliegtuigenfabriek (Dutch Aircraft Factory), carefully concealing the Fokker name because of his WWI involvement. Despite the strict disarmament conditions in the Treaty of Versailles, Fokker did not return home empty-handed: he managed to arrange an export permit for a shipment of aircraft parts and complete aircraft, among them 117 Fokker C.I's and 180 other types, such as D.VII and D.VIII. In 1919 six entire trains were taken across the German-Dutch border. This initial stock enabled him to quickly set-up shop. After his company's relocation, vast amounts of Fokker C.I and C.IV military air-planes were delivered to Russia, Romania and the still clandestine German air-force. Success came on the commercial market too, with the development of the Fokker F.VII, a smart high-winged aircraft capable of taking on various types of engines. Fokker would continue to design and build military aircraft and was delivering aircraft to the Dutch air force. Among foreign military customers, there was Finland, Sweden, Denmark, Norway, Switzerland, Hungary, and Italy. All these countries bought substantial numbers of the Fokker C.V reconnaissance aircraft, which became Fokker's main success in the latter part of the 1920s and early 1930s. In the 1920s, Fokker entered its glory years, becoming the world's largest aircraft manufacturer by late 1920s. 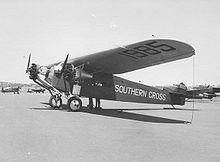 Its greatest success was the F.VIIa/3m trimotor passenger aircraft, which was used by 54 airline companies worldwide and captured 40 percent of the American market in 1936. It shared the European market with the Junkers all-metal aircraft but dominated the American market until the arrival of the Ford Trimotor which copied the aerodynamic features of the Fokker F.VII, and Junkers structural concepts. A serious blow to Fokker's reputation came after the TWA Flight 599 disaster in Kansas, when it became known that the crash was caused by a structural failure caused by wood rot. Notre Dame legendary football coach Knute Rockne was among the fatalities, prompting extensive media coverage and technical investigation. As a result all Fokkers were grounded in the USA, along with many other types that had copied Fokker's wings. In 1923 Anthony Fokker moved to the United States, where he established an American branch of his company, the Atlantic Aircraft Corporation, in 1927 being renamed Fokker Aircraft Corporation of America. In 1930 this company merged with General Motors Corporation and the company's new name would be General Aviation Manufacturing Corporation (which in turn merged with North American Aviation and was divested by GM in 1948). A year later, discontented at being totally subordinate to GM management, Fokker resigned. On 23 December 1939, Anthony Fokker died in New York City. At the outset of World War II, the few G.1s and D.XXIs of the Dutch Air Force were able to score a respectable number of victories against the Luftwaffe but many were destroyed on the ground before they could be used. The Fokker factories were confiscated by the Germans and were used to build Bx�cker Bx� 181 Bestmann trainers and parts for the Junkers Ju 52 transport. At the end of the war, the factories were completely stripped by the Germans and destroyed by Allied bombing. Rebuilding after the war proved difficult. The market was flooded with cheap surplus aeroplanes from the war. The company cautiously started building gliders and autobuses and converting Dakota transport planes to civilian versions. A few F25s were built. Nevertheless, the S-11 trainer was a success, being purchased by several air forces. The S-14 Machtrainer became one of the first jet trainers, and although not an export success, it served for over a decade with the Royal Netherlands Air Force. A new factory was built next to Schiphol Airport near Amsterdam in 1951. A number of military planes were built there under license, among them the Gloster Meteor twin jet fighter and Lockheed's F-104 Starfighter. A second production and maintenance facility was established at Woensdrecht. Picture - The Fokker F-27 turboprop airliner. In 1958 the F-27 Friendship was introduced, Fokker's most successful post-war airliner. The Dutch government contributed 27 million guilders to its development. Powered by the Rolls-Royce Dart, it became the world's best selling turboprop airliner, reaching almost 800 units sold by 1986, including 206 under license by Fairchild. There is also a military version of the F-27, the F-27 Troopship. In 1962, the F-27 was followed by the F-28 Fellowship. Until production stopped in 1987, a total of 241 were built in various versions. Both an F-27 and later an F-28 served with the Dutch Royal Flight, Prince Bernhard himself being a pilot. In 1969, Fokker agreed to an alliance with Bremen-based Vereinigte Flugtechnische Werke under control of a transnational holding company. They collaborated on an unsuccessful regional jetliner, the VFW-614, of which only 19 were sold. This collaboration ended in early 1980. Fokker was one of the main partners in the F-16 Fighting Falcon consortium (EPAF, European Participating Air Forces), which was responsible for the production of these fighters for the Belgian, Danish, Dutch, and Norwegian Air Forces. It consisted of companies and government agencies from these four countries and the United States. F-16s were assembled at Fokker and at SABCA in Belgium with parts from the five countries involved. In 1967, Fokker started a modest space division building parts for European satellites. A major advance came in 1968 when Fokker developed the first Dutch satellite (the ANS) together with Philips and Dutch universities. This was followed by a second major satellite project, IRAS, successfully launched in 1983. The European Space Agency (ESA) in June 1974 named a consortium headed by ERNO-VFW-Fokker GmbH to build pressurized modules for Spacelab. Subsequently, Fokker contributed to many European satellite projects, as well as to the Ariane rocket in its various models. Together with a Russian contractor, they developed the huge parachute system for the Ariane 5 rocket boosters which would allow the boosters to return to Earth safely and be reused. The space division became more and more independent until, just before Fokker's bankruptcy in 1996, it became a fully stand-alone corporation, known successively as Fokker Space and Systems, Fokker Space, and Dutch Space. On January 1, 2006 it was taken over by EADS-Space Transportation. Picture - Fokker 70, Fokker's last successful plane. After a brief and unsuccessful collaboration effort with McDonnell Douglas in 1981, Fokker began an ambitious project to develop two new aircraft concurrently. The Fokker 50 was to be a completely modernised version of the F-27, the Fokker 100 a new airliner based on the F-28. Yet development costs were allowed to spiral out of control, almost forcing Fokker out of business in 1987. The Dutch government bailed them out with 212 million Guilders but demanded Fokker look for a "strategic partner", British Aerospace and DASA being named most likely candidates. 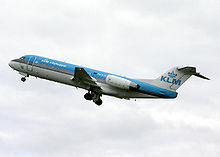 Initial sales of the Fokker 100 were good, leading Fokker to begin development of the Fokker 70, a smaller version of the F100, in 1991. But sales of the F70 were below expectations and the F100 had strong competition from Boeing and Airbus by then. In 1992, after a long and arduous negotiation process, Fokker signed an agreement with DASA. This did not however solve Fokker's problems, mostly because DASA's parent company Daimler-Benz also had to deal with its own organisational problems. On January 22, 1996, the Board of Directors of Daimler-Benz decided to focus on its core automobile business and cut ties with Fokker. The next day an Amsterdam court extended temporary creditor protection. On March 15 the Fokker company was declared bankrupt. Those divisions of the company that manufactured parts and carried out maintenance and repair work were taken over by Stork N.V.; it is now known as Stork Aerospace Group. Stork Fokker exists to sustain remarketing of the company's existing aircraft: they refurbish and resell F50s and F100s, and converted a few F50s to transport planes. Special projects included the development of an F50 Maritime Patrol variant and an F100 Executive Jet. For this project, Stork received the 2005 "Aerospace Industry Award" in the Air Transport category from Flight International magazine. In November 2009, Stork Aerospace changed its name to Fokker Aerospace Group. The individual companies within the group will also carry the Fokker name. The former Fokker aircraft facilities at Schiphol were redeveloped into the Fokker Logistics Park. One of the former Fokker tenants is Fokker Services. Meanwhile, Rekkof Aircraft ("Fokker" backwards) is attempting to restart production of the Fokker XF70 and XF100, supported by suppliers and airlines. In 1915, the Fokker E.I was the first "fighter" introduced into the German air force, leading to the Fokker Scourge. The introduction of the Fokker D.VII into the German air force in 1918 revolutionized aircraft design. In 1923, Oakley G. Kelly and John A. Macready completed the first non-stop flight spanning the North American continent in a Fokker T-2 Variant of Fokker F.IV. In 1927, Richard E. Byrd completed his trans-Atlantic flight from New York City to Paris in a Fokker F.VII. In 1928, Amelia Earhart, the first woman to fly across the Atlantic as a passenger (from Newfoundland to the small Welsh town of Burry Port) did so in a Fokker F.VII piloted by Wilmer L. Stultz. In 1928, Charles Kingsford-Smith completed the first trans-Pacific flight in another F.VII. The Fokker S-14 Machtrainer was the first purpose-built jet training aircraft in the world (1951). Fokker Pictures and Fokker for Sale.